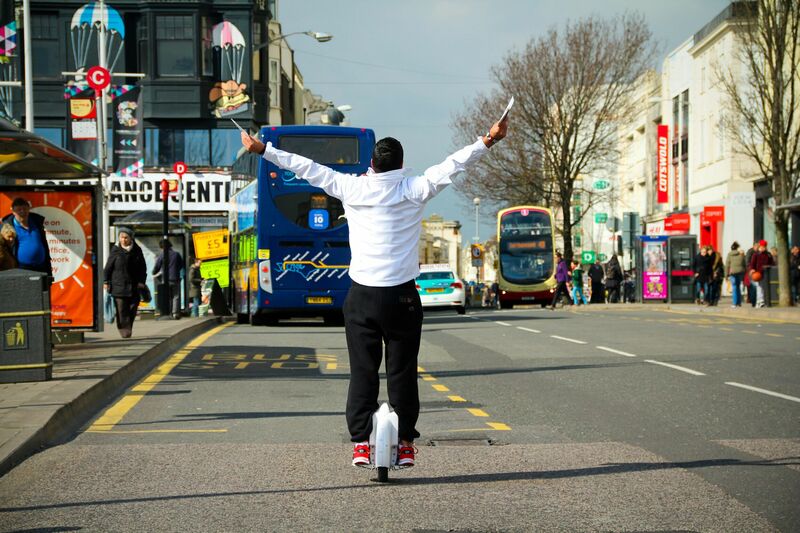 Abstract: As Airwheel is becoming a global trend, Airwheel adults electric unicycle riders went to streets of Cardiff, Manchester and Brighton of UK to promote a fun alternative means of transport and a new lifestyle. 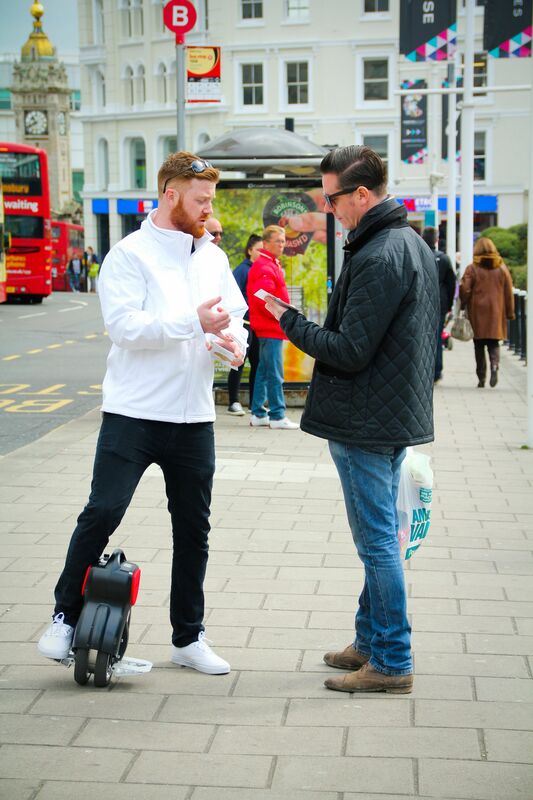 From March 21–22, Airwheel riders came to streets of Cardiff of Wales, Manchester and Brighton promoting Airwheel’s futuristic personal transporter. This two-day Airwheel UK tour made a sensation in UK. In each city, a team of Airwheel self balancing unicycle riders were sent out to the streets at the same time. The wheels successfully caught attention from pedestrians as three teams whizzed across streets. Airwheel’s exterior design is beautifully concise and eye-catching, and you may find it share some resemblance to a skateboard. “They immediately put people in mind of the hover board in ‘Back to the Future,’” as was remarked by a stunned local resident. Yes! Airwheel is such a futuristic device. Actually, science and technology is headed in this direction and towards that mode of transport. Airwheel defines the future commute concept. The Airwheel adults electric unicycle UK tour intends to extend this fun and eco-friendly device to more people and the Airwheel riders were trying to introduce to the public a new lifestyle. 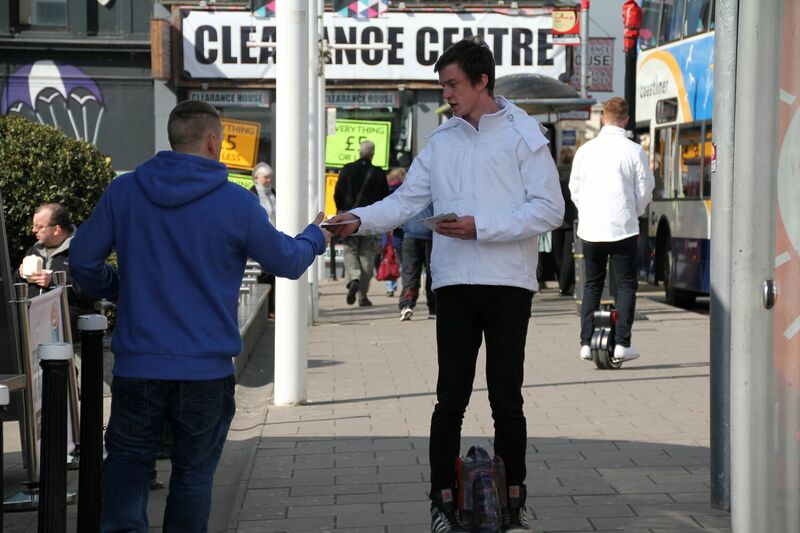 They were doing this by sending out booklets and questionnaires to pedestrians who were interested in the Airwheel as well. Based on the latest gyro technology, Airwheel is a self-balancing electric unicycle. It is portable, cheap to run, fun to ride and environmentally friendly. It can be a perfect alternative to be taken in the metro or bus. It’s easy to use and quite safe: you just need to lean forwards to go forward, and back to slow down or go backwards. And the power cuts automatically if you jump off and pedals rises to prevent you from leaning too far when the speed exceeds the safe range. Now Airwheel is becoming a global trend everywhere. It really feels like you're gliding once you step on the wheel. It’s not just for fun. City commuters are now using them to cover the last few miles from the Tube station to home. Compared with a Segway for example, the Airwheel electric unicycle is so lightweight that you can zoom to your station, stick it on the overhead compartment, get to your destination, take it down and zoom to work. Now, the company comes up with a twin-wheeled version, which is easier to learn to ride. Go and get one now, and try it by yourself.